The Ozark Mountains reach into Missouri, Arkansas, Oklahoma, and Kansas, forming a region with great natural beauty and a distinctive cultural and historical landscape. 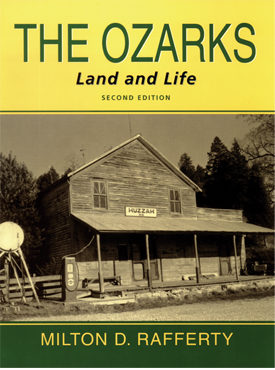 This comprehensive volume, a fully updated edition of a beloved classic, reaches into history, anthropology, economics, and geography to explore the complex relationships between the Ozarks’ people and land through times of profound change. Drawing on more than thirty years of research, field observations, and interviews, Rafferty examines this subject matter through a range of topics: the settlement patterns and material cultures of Native Americans, French, Scotch-Irish, Germans, Italians, African Americans, Hispanics, and Asians in the region; population growth; the guerrilla warfare and battles of the Civil War; the cultural transformations wrought by railroads, roads, mass media, and modern communication systems; the discovery, development, and decline of the great mining districts; the various forms of agriculture and the felling of the region’s vast forests; and the built landscape, from log cabins to Victorian mansions to strip malls. This new edition also explores the new and potent forces which have reshaped the region over the last twenty years: tourism and the growing service industry, suburbanization, rapid population growth and retirement living, and agribusiness. Lavishly illustrated with historic and contemporary photographs, maps, and charts. Milton D. Rafferty is Professor Emeritus of Geography, Geology, and Planning at Southwest Missouri State University. He is the author or editor of nine other books and atlases, including A Geography of World Tourism and Rude Pursuits and Rugged Peaks.